Will Idiot Politicians Destroy our World? Is the future of options trading endangered? Under ‘normal’ conditions I would have confidence that the inmates to not run the asylum. But today’s politicians are dumb enough to do anything. Opinion and Analysis from the Tabb Forum. A proposal to reform the taxation of financial instruments would dramatically change the tax treatment for options strategies, potentially decimating trading volumes by as much as 40%. And it is not the so-called ‘fat cats’ of Wall Street that will be impacted by the proposal; instead, the biggest impact will be felt by asset managers and Mom and Pop investors. The US listed options market is under attack. And if Washington politicians have their way, it is destined to become a mere shadow of its current form, with far-reaching implications for the financial industry and end users such as retail and institutional investors. The danger lies in a proposal put forth by Representative David Camp (R-Mich.), Chairman of the House Ways and Means Committee, that contains a number of provisions intended to reform the taxation of financial instruments. Of particular interest to options market participants are proposals that dramatically change the tax treatment for strategies incorporating the use of options that have been a mainstay of the business since its inception in 1973. The proposal will potentially decimate trading volumes, with total industry volumes seeing a decline of as much as 40% if the proposal is implemented in its current form. And it is not the so-called “fat cats” of Wall Street that will be impacted by the proposal. It is also not targeted at toxic flow that is perceived as having a discernible edge over other investors. The Camp proposal impacts both retail and institutional demand for options. The biggest impact will be felt by asset managers and Mom and Pop investors that are increasingly using options to earn premium income and manage price risk in their equity holdings. TABB Group estimates that in 2012 retail investors accounted for 14% of total US options volume, with traditional asset managers and hedge funds accounting for an additional 38% of the total. It is volume from these two segments that will be impacted the most by the new tax scheme and, given their critical role in the options market, any tax law changes impacting demand from these two segments needs to be closely analyzed. Rep. Camp’s proposal may be well-intended, but it is the unintended consequences that will decimate the options market. Surprisingly, it is not exotic options strategies designed to avoid taxes that are the focal point of the reform. Instead, the proposal targets plain vanilla listed options strategies used by main street investors that have begun to embrace options as a way to earn income or to hedge equity ownership. Under current law, losses and gains resulting from options trading are treated as either long- or short-term capital gains, depending on the type of option and strategy. However, the Camp proposal treats these same transactions using a drastically different framework and includes a number of provisions that will result in many common options strategies triggering a taxable event on underlying holdings of equities. For example, if an investor holding appreciated stock writes a call, the stock will be treated as sold and tax would be due on the gain. The same situation occurs when the investor buys a put to hedge against a decline in the stock. The Camp proposal, however, treats losses somewhat differently than gains. If there is a loss in the stock when an option transaction occurs, the loss cannot be realized until the underlying stock is sold. It seems that Washington wants to have its cake and eat it, too. Clearly, investors will think twice about using options to either earn premium or hedge their risk, something the proposal seems not to take into account. Not only will investors be subject to immediate tax liabilities, they will also need to maintain scrupulous records for year-end tax and accounting purposes. Once the taxable event occurs, the cost basis for the stock needs to be adjusted. Imagine the level of record-keeping a stock holder using a monthly covered call writing program would need to collect and maintain? The complexity only gets worse. How does an investor allocate shares if he only buys puts or writes a call on a portion of his position? The record-keeping nightmare associated with current tax laws will seem like utopia if these new rules were to kick in. The prospect of the new rules alone is enough to create mind-numbing fear for investors and send chills up the spine of accountants who will certainly see added business in the months and years following any potential implementation of such a rule. Even though the Camp proposal may not dissuade all investors from using these options strategies, it will have a chilling effect on retail and institutional investors. Although the use of puts as a hedging tool accounts for a minor portion of activity for these sectors, the use of covered call strategies accounts for a much greater share of activity. Under the new rules, there will be little benefit in using premium strategies to earn income and even less desire to use puts to hedge a portfolio. US options markets are deep, liquid and provide a vast array of market participants with a powerful tool they can use to manage exposures. 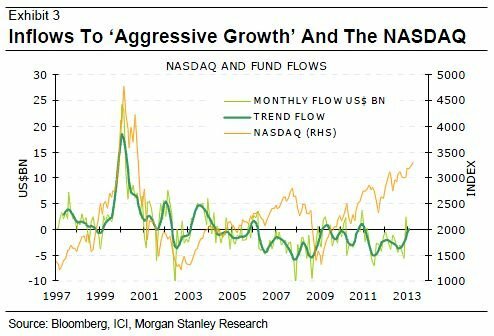 Volume has remained strong throughout the financial crisis, as investors flocked to the market as a way to manage risk and earn income, and as an efficient way to take directional exposure. But US options market’s very existence is being threatened by misguided tax policy contained in Representative Camp’s proposal. The options industry needs to continue its efforts to educate Washington on the valuable benefits listed options provide to investors. One such effort is being driven by a coalition of exchanges and the OCC, which are actively working to educate politicians and staffers that are drafting the proposed tax legislation. Its comment letter delves in much greater detail into the types of options strategies impacted by the Camp proposal and is a must-read for all options market participants. I agree that education is essential. However, when the source of that education is the industry involved, then it is called lobbying and will garner no respect. I wish I knew what to do – other than electing people with a modicum of intelligence as our representatives. Comments Off on Will Idiot Politicians Destroy our World? My purpose for writing this post is to help traders gain valuable insights when using options. There is probably nothing herein that you do not already know. However, it is often true that although we know strategy A and understand principle B, we may fail to see the benefits of using them together. Please understand that this single post does not contain enough information for traders who are first learning about any of the strategies mentioned. The assumption is that you already have some experience reading about, or trading, the various strategies. Lacking that knowledge, may I recommend the Rookies Guide to Options. The expanded and revised 2nd edition will be available in June, 2013. However the first edition is still available as an e-book). I recommend waiting, but if you truly prefer an e-book, there are no immediate plans to publish the 2nd edition as an e-book. NOTE: Every item discussed applies equally to the more directional play, the diagonal spread. The diagonal is to the double diagonal as the single credit spread is to the iron condor. Half the trade that comes with a market bias. Traders should not initiate a double diagonal spread just because they want/need something to trade. There must be a good reason. Do not choose the diagonal spread (single or double) for the reason that ‘you like it.’ This trade is a true bet on volatility as well as a bet on a range-bound market. and the market moves lower (low enough for YOU to become uncomfortable owning the position. That could be 1850, 1820, 1800… There is no single price level that triggers an adjustment for every trader). When you decide than an adjustment is in order, there are two major decisions to be made. This is similar to the decisions of the iron condor trader, whose job it is to make the position something worth owning and to reduce immediate risk. –Do I still want to own a calendar spread? –Is IV now too high to continue owning positive vega? –Do I still want to own the iron condor in the current market environment? –If yes, I must choose an appropriate adjustment strategy. 1) You do NOT want to own the embedded calendar. In that scenario, one possible adjustment is to make the following trade. It can be done as two separate spreads, or as a single 4-legged spread (recommended). –Result: The diagonal has been converted to a credit spread (or half of an iron condor). 2) You do want to own the embedded calendar. –Nothing complicated here. Reduce size or buy protection or roll by covering the diagonal and substituting another with appropriate long and short options. This series of videos is targeted to rookie options traders By the time you get through the series, you will have a solid understanding of how these spreads work and how you can use them. Last week I offered some questions in the form of a quiz. Only two members chose to reply publicly, but let’s look at those replies and see what we can learn from the quiz. a. GOOG one-lot iron condor. I agree that trading one-lots is too costly when commissions are considered. However, that does depend on your specific arrangement with your broker. b. SPX 10-lot iron condor, 10-points wide. As far as George is concerned, this is a bit large. I do not like the idea of placing 20% of the account value at risk for a single trade, and prefer to see George trade this in smaller size – or not at all. This is not ‘so good’ that he has to take a position. c. RUT, CTM iron condor. I like this trade. Two-lots is an appropriate size, but would not object if George traded up to 5 lots. Is the premium too low? Is this 25-delta, 45-day spread worth $500? Premium seems okay to me for an IV 18 underlying. Commissions do not bother me for this trade. The high premium is enough (my opinion) to offset high commissions. And again, some brokers change nominal fees. d. Weeklys trade. Not recommended for George. I’d prefer to see more experience, but more importantly, this is not a goo trade for the very conservative trader. I would consider it for my account during periods (not right now) when volatility has been especially low for a couple of weeks. None is too good to miss. Only the 10-lot SPX iron condor could be a comfort zone problem, based on position size. Investors are dumb. So says retiring Wall-Street analyst, Gerard Minack. I thought this piece from Business Insider to be worth sharing. Morgan Stanley’s Gerard Minack is arguably the most underrated strategist on Wall Street. His two-page “Downunder Daily” reports were must-reads for anyone looking for a clear, straightforward perspective on the state of the markets. While we’re sad to hear that he’s retiring, we love his last note. “Investing is an unusual profession: perhaps the only one where amateurs have a good shot at beating the pros,” said Minack as he opened his note today. The biggest problem appears to be that – despite all the disclaimers – retail flows assume that past performance is a good guide to future outcomes. Consequently money tends to flow to investments that have done well, rather than investments that will do well. The net result is that the actual returns to investors fall well short not just of benchmark returns, but the returns generated by professional investors. 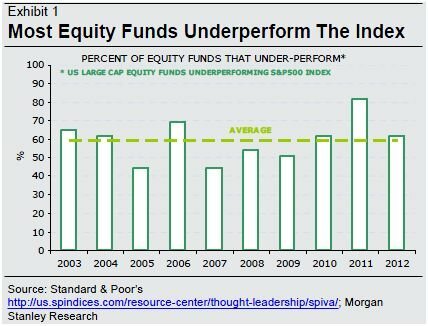 So, you have two things going on here: 1) Investors think actively-managed funds that have done well in the past will do well in the future. The chart above demonstrates why this type of thinking puts you way behind the curve. 2) Investors, because of behavioral biases, will load up on the highs and sell at the lows. As a result, investors will underperform the very investment that they are investing in. This second point is extremely important. Minack demonstrates this in two charts. This second chart demonstrates the implications of the mistake made above. 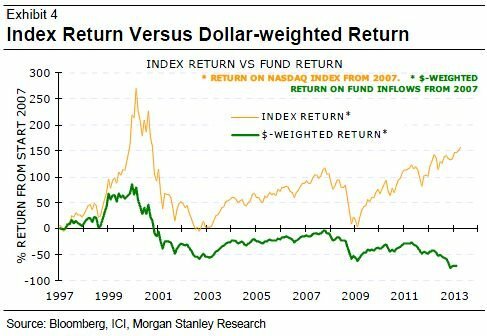 It shows investors’ dollar-weighted returns. In other words, it shows what happens to returns when an investor buys high and sells low. In this example, an investor who bought the index for $100 in 1997 and waited patiently would have around $150 today. However, the person who followed their gut, and traded with market fluctuations would’ve lost 75%. In short, amateurs may be able to beat the investment professionals, but most do far worse. This keeps professional investors in business (and that keeps people like me employed, which is nice). But it means that returns to investors typically lag benchmark returns by a long margin. The outlook, in my view, is for low returns ahead, as measured by common benchmarks. If investors continue to receive materially worse returns than those benchmarks, effective returns are likely to be derisory. In other words, people like Minack have jobs because you’re probably stupid. I’m retiring from Morgan Stanley, so this is my last note. Thanks for the brickbats and bouquets over the years – at least I knew you were reading. I’ve always said that those that can, do; those that can’t, broke; and if you can’t broke, consult. On that basis I’m off to do the latter, after a three month break.